Ecological Rice Farming in the Northeastern USA is an effort to support sustainable, small-scale, organic rice production in the northeastern United States. This website highlights experiences on Akaogi Farm in Westminster West, Vermont and provides agricultural and environmental information about rice cultivation in this northern climate extreme. Details about the annual summer conferences are also available. The conference took place on Saturday, August 2nd, 2014 from 9am-4pm at Akaogi Farm. 2014 Conference details. 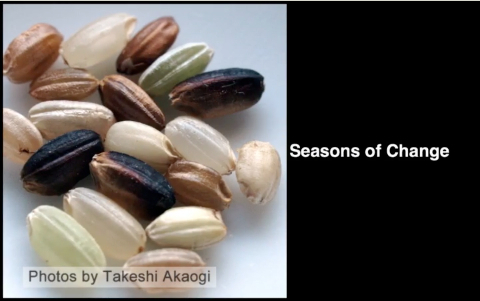 View the "Seasons of Change" video slideshow. Enjoy a season's worth of ecological vibrancy and diversity in the Akaogi Farm rice paddies through Takeshi Akaogi's photographs. This effort is currently funded by the National Science Foundation. In 2008 and 2009, funding was provided by a Northeast Sustainable Agriculture Research and Education (SARE) Grant.